Orange Mint (Mentha x Piperita Citrata) other names : Bergamot Mint , Eau-de-cologne Mint , Lime Mint , Orange Mint , Su Nanesi , Water Mint , Yerba Buena. Orange mint (Mentha x Piperita Citrata), also known as bergamot mint, derives its name from the fact that when the leaves of this plant are crushed, they have a somewhat orange flavour. Orange mint belongs to the Labiate or Lamiaceae family. Orange mint grows up to two feet in height and orange mint spreads depending on the prevailing conditions. This herb is often used to prepare a tea akin to that of lemonade. Sometimes, this herb is also used for flavouring foods as well as in potpourris. The vividly green leaves of orange mint are oval shaped and appear on attractive stems whose hue varies from green to burgundy. Provided you allow this mint hybrid to blossom, it bears white and pink spiked flowers between the middle and late summer. The orange mint plant is potently aromatic and its flavour is stronger compared to the other mint varieties. The aroma of orange mint has a note of citrus and spice with a lavender tinge. The aromatic properties of this plant are augmented when its leaves are bruised. Orange mint is basically a mint variety which is especially bred so that it possesses a characteristic citrus aroma as well as flavours that remind one of oranges. 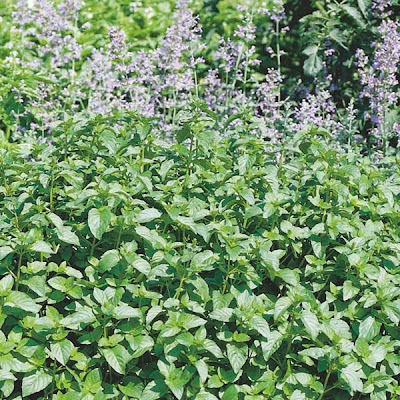 You can use this particular mint cultivar in a number of ways in your home as well as garden. Usually, orange mint can be obtained from garden stores either as seedlings or seeds. In addition, you may also propagate this hybrid mint variety from cuttings, provided you are friendly with someone who already has a mint orange plant and will let you to make a cutting from the plant. If you let an orange mint plant to grow without any obstruction, it will have extensive branches and the plant will gradually develop into an expansive shrub. You may, however, prune the plant with a view to restrict its free growth and also to keep it in shape. Trimming the orange mint herb will help you to keep it under control as well as promoting new growths. This plant also thrives extremely well when grown in containers in your garden. You can also grow orange mint indoors, especially on a sunlit windowsill. When grown in a garden, you can use the orange mint to attract butterflies. Besides, the orange mint can also be used to make an exquisite fragrant border or groundcover. This plant can also be put to wonderful use in your garden in the form of an aromatic foliage background. You may also plant orange mint at the back of your bed with a view to make it appear additionally lush and full as well as to make up for the blossoms planted in the front of your bed. Generally speaking, the aroma as well as flavour of orange mint is most pleasing when you use it fresh - using the herb fresh helps it to release its delicate fragrance and flavour. Nevertheless, you may also dry out the herb and store it for use when needed. Alternately, this herb may also be frozen. Always remember to store dried orange mint in airtight containers, placed in a cool and arid place away from light. Moreover, stored orange mint should necessarily be used within six months. On the other hand, if you are freezing orange mint, it is advisable that you do it in small batches; so that you just take out the amount you require and not expose the entire lot to air, light and temperature. Orange mint is indigenous to Europe and since long it has been used for its aromatic attributes, both for its use as room, and body deodorants as well as in culinary. It is very easy to grow orange mint and the plant thrives well in damp soils and conditions, provided the soil does not become very arid or parched. In fact, orange mint grows excellently in rich clay soils. If you desire to obtain the plant’s essential oil, it is advisable that you grow the species in a sunlit place. However, the herb will also thrive well in semi-shade. Orange mint plants have a preference for soils that are somewhat acidic. Moreover, these plants can endure neglect and thrive even in long grass. The blooms of orange mint attract lots of bees as well as butterflies. This is an excellent companion plant for cultivating close to tomatoes and cabbages, as the orange mint plants help their neighbours by repelling insect pests. In order to stop the orange mint plants from turning out to be invasive and disturb the growth of other plants nearby, it is advisable that you grow them in containers. The whole orange mint plant possesses a mint-like fragrance with a tinge of ginger also. Orange mint will yield superior quality essential oil provided the plant is grown in a dry soil. Orange mint has a number of utilities, including therapeutic and culinary. The leaves as well as the flowering orange mint plant possess antiseptic, analgesic, antispasmodic, cholagogic, carminative, diaphoretic and vasodilator attributes. Traditionally, a tea prepared from fresh or dried out orange mint leaves has been used for curing nausea, stomach pains, various digestive problems and parasites. It is also given to people suffering from neurological problems and having a weak stomach. This herbal tea is also said to cure headaches and fevers. Similar to several other plants that belong to the genus Mentha, orange mint is frequently used in the form of an herbal remedy. This herb is particularly held in high esteem for its antiseptic attributes as well as its favourable effect on the digestive process. The therapeutic uses of orange mint are quite similar to those of lavender (Lavandula spp.) compared to other mints. This herb is employed for treating a number of conditions including nervous exhaustion, rapid heartbeat, infertility and many others. The leaves of the herb are collected as soon as it starts producing flowers. Subsequently, the leaves are dried out and stored for future use. It is interesting to note that the whole orange mint plant yields an essential oil which is an excellent lavender oil source and used extensively in perfumery. In addition, this oil is also employed in the preparation of oral hygiene products and toiletries as well as other items. Earlier, orange mint was employed in the form of a strewing herb - the leaves of the plant were strewn all over one’s place, as it keeps rats, insects and others away. In fact, mice and rats loathe the aroma of mints. Hence, orange mint was strewn in homes as well as granaries for protecting the grains from rodents. Orange mint has a number of culinary uses. This herb’s flavour and aroma are best when it is used in fresh recipes. You may also chop the fresh herb and use it in fruit salads as well as in grain salads. The minced leaves of orange mint may also be added to dressings, sauces, jellies and vinegar. When used in desert preparations based on fruits and chocolates or in cream like tarts, ice creams and crème Brule, the flavour of orange mint is excellent. You may also use orange mint in the form of a flavouring agent or infuser for lemonade, teas as well as cocktails. You may also use the whole leaves of orange mint in the form of a garnish of specific savory dishes as well as sweet deserts. You may consume the leaves of orange mint raw or after cooking. While the leaves of true Bergamot mint (also known as eau-de-cologne mint) possess an extremely spicy flavour and are too very aromatic for most tastes, the flavour of the cultivar ‘Basil’ is excellent and can be wonderfully substituted for basil while preparing pesto. The fresh or dried out leaves of orange mint or bergamot mint may also be used to prepare a refreshing herbal tea. As discussed earlier, you may also use the leaves of this herb in preparing flavourful dishes, particularly Southeast Asian and the Middle East cuisines. People in the Middle East and Southeast Asian countries usually use citrus and mint together in their dishes. In addition, you may use the leaves of orange mint while making pudding, various desserts and sorbet. Orange mint is generally safe for use by almost everyone, but certain precautions are needed while taking this herb. Similar to other plants belonging to the genus Mentha, pregnant women should not use orange mint, as large doses of this herb may result in miscarriage. The essential oil contained by orange mint is known to be antiseptic, but it may prove to be toxic when taken in excessive amounts.